JERSEY CITY, NJ, April 10, 2017 – With the cut of a ceremonial ribbon, the 152-suite Residence Inn by Marriott® officially opened today in downtown Jersey City, New Jersey. 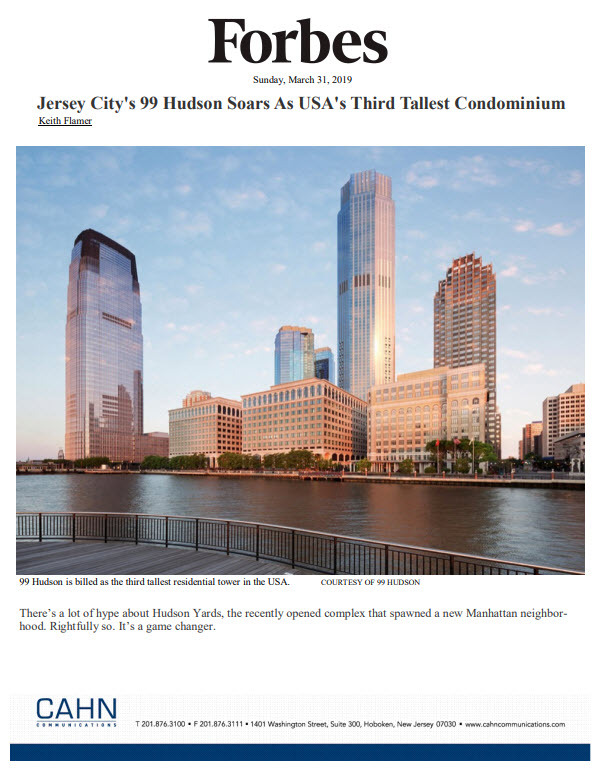 The all-suite Residence Inn Jersey City will operate as a Marriott franchise and is owned by Columbus Hotel Urban Renewal, a joint venture entity of Ironstate Development Company of Hoboken, New Jersey and Panepinto Properties of Jersey City. The hotel is managed by True North Hotel Group of Overland Park, Kansas. Located at 80 Christopher Columbus Drive in the heart of this vibrant urban destination and just minutes from Manhattan via the adjacent Grove Street PATH Station, ten miles from Newark International Airport and 15 miles from LaGuardia Airport, the Residence Inn Jersey City offers business and leisure travelers convenient access to the myriad commercial, cultural, entertainment, dining and nightlife pursuits located on both sides of the Hudson River. The opening celebration drew public officials led by U.S. Senator Robert Menendez (D-NJ) and Jersey City Mayor Steven Fulop, community dignitaries and business leaders. The influential group of attendees all touted the role the hotel will play in advancing Jersey City as the best midsize city in America. The 14-story Residence Inn offers studio and one-bedroom suites with dramatic Jersey City, Statue of Liberty and Manhattan skyline views. Guests looking for a revitalizing sleep experience will enjoy the hotel’s plush mattresses and crisp linens, while those focused on being productive will value their suite’s large, well-lit work desk, ergonomic chair and complimentary high-speed Internet access. Designed for short to long-term stays, each suite also has a fully-equipped kitchen with a coffeemaker, microwave oven and residential-sized appliances, while one deluxe suite features an oversized balcony for desirable outdoor space. The new hotel rotates a wide selection of choices at its complimentary daily hot breakfasts. Favorites like bacon and eggs, Greek yogurt, cut fruit or waffles are complemented by an extensive offering of toppings, ranging from fresh spinach and cheese to sliced almonds and strawberries. Extending the feeling of comfortable living on the road, the Residence Inn Jersey City offers guests inviting and functional public spaces to relax or collaborate. Road warriors and families alike enjoy the hotel’s grocery delivery service, 24-hour onsite food and beverage market, dry cleaning services, and onsite guest laundry room. Additional amenities include a state-of-the-art fitness center, 360 square feet of meeting space to accommodate functions of up to 15 people, and complimentary Wi-Fi, fax and copy services. The hotel also features a full-service bar, and a rooftop patio offering breathtaking views, a barbecue grill and fire pit will open in 2018. “Given True North’s deep history and expertise in extended stay and, specifically, with the Residence Inn brand, we are very excited to bring our unique level of service to guests of this beautiful new property,” added Lew Wiens, chairman and CEO, True North Hotel Group. The Residence Inn Jersey City was developed by Ironstate Development Company and Panepinto Properties, with advisory support from Wave Hospitality Advisors, as part of the Partnership’s larger mixed-use development effort along Christopher Columbus Drive. The overall project includes three residential towers comprising 1,484 luxury rental residences, a 30,000 square-foot Base Gym, and the recently-opened Sprout Market Place. The development has helped transform the Grove Street neighborhood into an area teeming with new restaurants, culture and street life, including the bustling, car-free Newark Avenue which was recently named one of the hottest blocks in the New York City area by the New York Post. Expressly designed for its Jersey City location, the Residence Inn combines modern architecture with an urban sensibility to create an aesthetic and hospitality experience that reflect its surroundings. As a nod to the arts, long a cherished part of the fabric of Jersey City, the developers commissioned 240 works of art by regional artists, many of whom are Jersey City residents. The collection of paintings, sculpture, and embellished limited edition prints was curated by Stefania Panepinto of Panepinto Fine Art and are displayed throughout each of the hotel’s guest suites and public amenity spaces. For more information or reservations, call the Residence Inn toll-free number at 800-331-3131 or visit residenceinn.marriott.com.